The fan belt packed it in just after lunch. Been trying to make one out of Dimaleen. I’m on my second prototype and I think I may have it this time. Keep your fingers crossed. West Wind II has been taking care of herself in very very light wind and making unbelievable time while I pull an Apollo 13 MacGyver repair here. Got all the possibilities laid out and just finding out what works and what doesn’t. Lots of possibilities so should be able to make something work. Will keep you posted. Been thinking of you since you left Rarotonga, glad you enjoyed the food particularly the tomatoes! 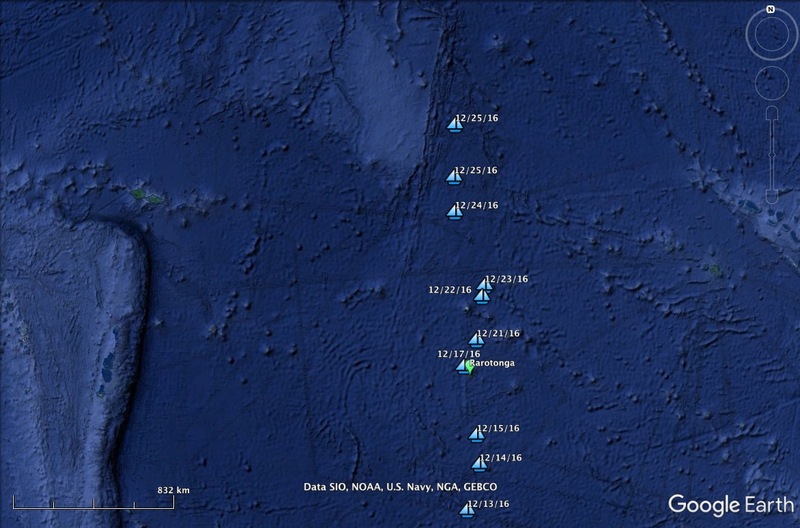 We will follow your progress when we have internet and wish you a safe passage to Honolulu and beyond.